Here is a simple way to customize your gnome desktop to show random text taken from a file. I use it to learn Chinese, but it can be easily modified for any other kind of textual information. Using inkscape, I made a template SVG file for the background. 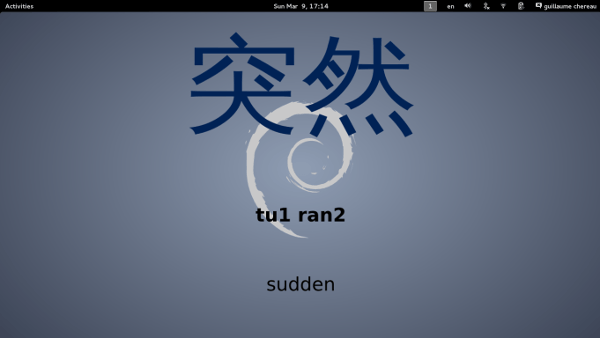 I started from the default gnome 3 wallpaper, and I added three text elements: one for the Chinese characters, one for the pinyin, and one for the English translation. In place of the text I used "@chinese@", "@pinyin@", and "@english@". Later my script will substitute those placeholder words with the correct values. I wrote this python script. Every 10 minutes, the script would pick a new random entry from my input file, generate a png file from the svg template, and run the gsettings command to use it as a new wallpaper. I added the script to my startup application (using gnome-session-properties).